Saturday evenings I take a few hours over at church in preparation for the morning. It works best when I am alone. 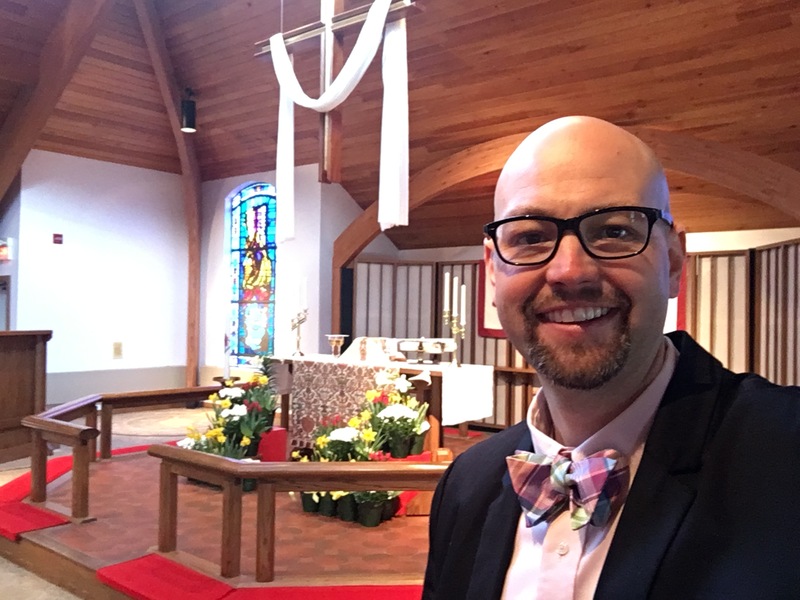 I can run through the sermon a few times in the sanctuary, spend time going through the worship folder and making notes for the announcements, making sure the set-up is ready for Sunday School, and when I am teaching – going over my plans and as the saying goes, “getting all my ducks in a row.” Even though this time is spent in solitude I don’t think I’m alone in it – I’m thinking of the people who will be here in the morning and both what they might bring and take with them. I think of perhaps new people arriving, and how they might respond to our hospitality. I think of my pastoral colleagues and how they are making their preparations for the morning too. I think of the faith that weaves us all together, and the God who gathers us beside the manger and beneath the cross. Yet even though my thoughts are on the words I will say to a group of people gathered it is a spiritual discipline spent in isolation to get ready. I like to walk through the church without the lights on – to check on things, but sometimes, also to notice the shadows. Without thinking about it I helped create one. You may have noticed the new friends that adorn the foyer windows. 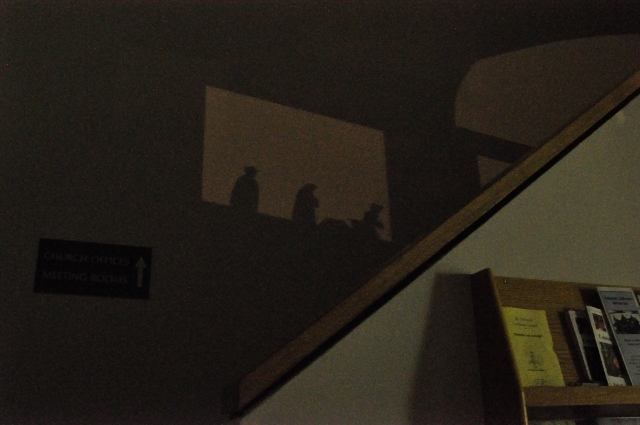 As I was headed home for the night this past week I noticed a silhouette of the wise men projected upon the wall of the staircase. Pictures can’t quite capture it, but it was beautiful. I associate with those Magi from the East, who are not quite sure what they are in for, but follow anyway. Advent is like that. Faith is like that. An Advent Faith is exactly that. We follow, longing for Christ to come, not quite sure which way we will get there but taking one more step anyway. We know the light is near, and yet the darkness suits us well. We can see the flickering, and find a new place in it. There are rhythms to Advent of course, but no two are exactly alike – just as no two days are exactly alike either. To think we can simply replicate former days is to miss the point. To attempt to control it is to miss the point. To do it our way without bending is to miss the point. Faith is as much a surprise as it is a certainty. Advent is standing in the dark and noticing the shadows more than it is getting closer to the light. Getting ready and keeping awake (to borrow some Advent phrasing) has more to do with leaving room for joy amidst the busyness everywhere else, than it is making sure we reach predictable outcomes. Just ask the Magi, or the shepherds, or even Mary and Joseph what they thought might happen. Go ahead. Ask. Read the stories again (Luke 2 and Matthew 1-2), and regain your sense of wonder. You won’t find it in the daytime or with all your lights on, but it lingers waiting for discovery in Advent Shadows. I came home that night and shared my discovery of the Wise Men Shadow with my sister and brother-in-law. Sunday night Mike and I came over to church in the dark to take some pictures, and spent some time enjoying the shadow. It always amazes me what lenses can and cannot capture. Mike was good enough to share this picture with me, and I share it with you – that is what sharing good news is all about – but ultimately – you must be led to discover it for yourself. Linger in the dark and notice the shadows. See where Advent takes you…Christ in near. This entry was posted in Advent/Christmas, Advent/Christmas Posts, Special Days. Bookmark the permalink. Thanks! It really is pretty cool. I move the wise men each week (will do after activities tonight). I’m interested how the shadow will change.